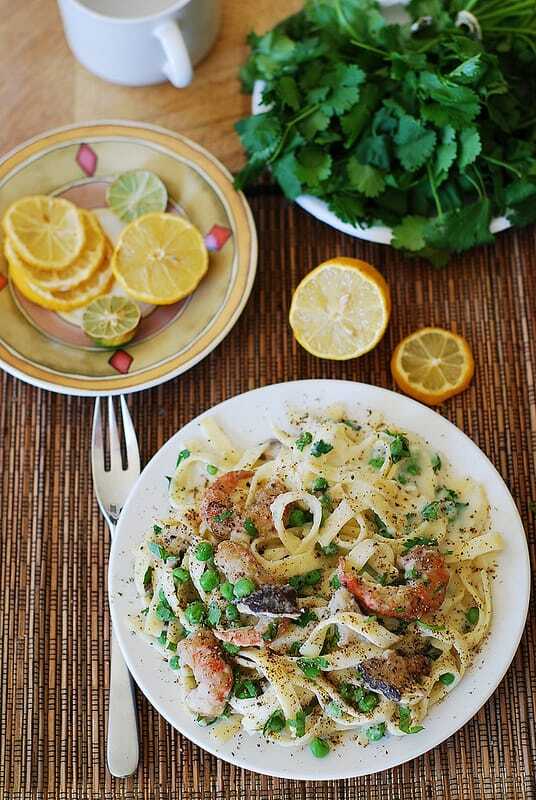 Healthy fettuccine alfredo with shrimp & mushrooms. Made with cauliflower sauce, this creamy pasta is a healthier version of a regular fettuccine alfredo. After I made a healthier version of classic alfredo sauce 2 months ago, I had dreams at night (or you can call them nightmares) of how I was making different variations of that recipe, torturing myself with endless combinations of ingredients I could combine with that amazing cauliflower-based alfredo sauce. And, what do you think, did I come up with a super original recipe after all those sleepless nights? Not at all. I came up with something pretty basic but yet so delicious in its simplicity that I definitely call it another win in a “healthy food department”: healthy fettuccine alfredo with shrimp and mushrooms in a creamy cauliflower sauce. 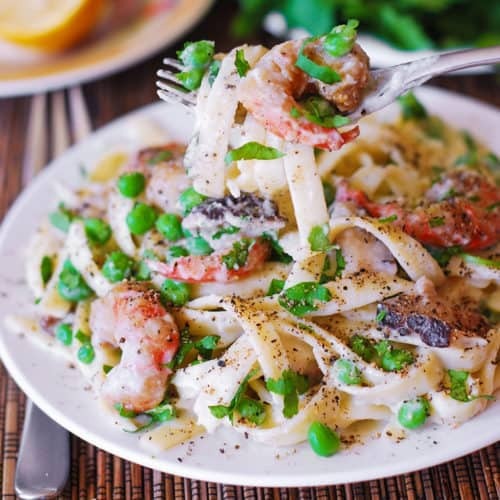 Because shrimp and sauteed mushrooms usually go so well with the original alfredo sauce, I just combined all these wonderful ingredients together in one healthy dish: shrimp, mushrooms, sweet peas, pasta – all coated in a creamy cauliflower sauce! Yum! Definitely worth trying! 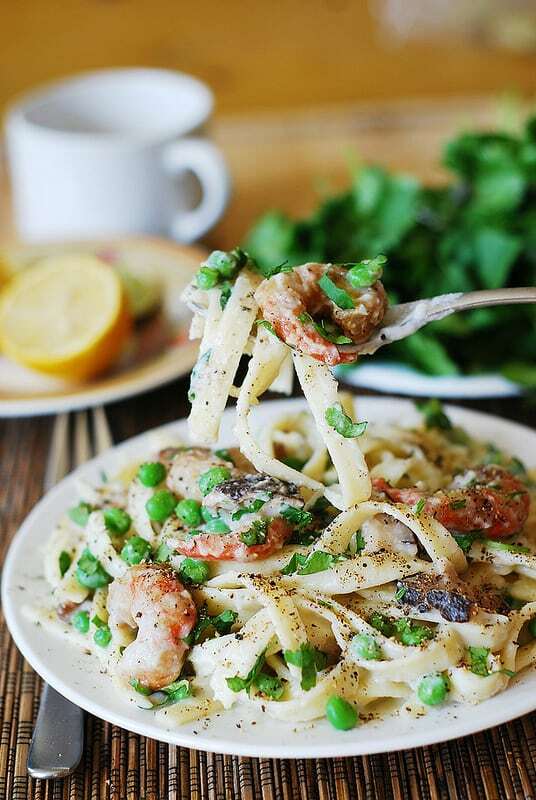 This shrimp fettuccine alfredo is rich only in flavor, but not at all in calories! In fact, a whole pan of this sauce uses only 1/4 cup heavy cream and 1/2 cup Parmesan cheese, everything else being replaced by very finely mashed cauliflower, mixed with sauteed shallots and garlic for more flavor and fragrance. 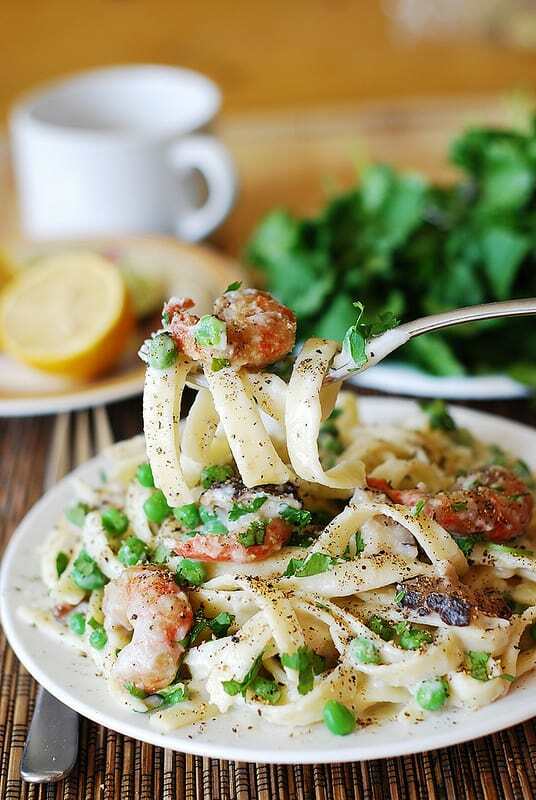 Loaded with mushroom flavor, this healthy fettuccine alfredo with shrimp and mushrooms will leave you fully satisfied, yet you will not feel like you just ate a heavy meal loaded with heavy cream or cheese. Please enjoy this healthier version of alfredo sauce, made even better by adding shrimp, sauteed mushrooms, and sweet peas! Healthy version of fettuccine alfredo made with cauliflower sauce. Add shrimp, mushrooms, and peas and you have a delicious pasta recipe! Clean the cauliflower head from green leaves, and chop it into reasonably large but manageable pieces. Place it in the big sauce pan with water, bring to boil and boil for 30-40 minutes until cauliflower is really soft. Remove from heat and drain cauliflower from water. Do reserve some cooking water. Melt the butter in a medium saucepan over medium-high heat. Add minced shallot (or 2 tablespoons of minced regular onion) and minced garlic and saute until tender. Add heavy cream and Parmesan cheese and bring to a boil. Cook just for a minute, stirring, until cheese melts. Remove from the heat. In a food processor, combine cauliflower from step 1 and creamy sauce from step 2. Process really well, until a very creamy sauce forms. Feel free to add more heavy cream or cooking water (using 1/4 measuring cup) from step 1 to thin the sauce if it is too thick. Transfer sauce into a large sauce pan and keep it warm on the stove top. Season with salt and pepper, and nutmeg, to taste. Bring a large pot of water to boil and cook the fettuccine in boiling salted water until al dente. Drain. Cook the peas in boiling water for about 5 minutes, or according to instructions if using frozen peas. You can also add peas to pasta during the last 5 minutes of cooking instead of cooking them separately. In a large, separate skillet melt 1 tablespoon of butter over medium heat and saute mushrooms until soft and browned. Season with salt and pepper. Combine the cauliflower sauce, cooked shelled peas, and pasta cooked al dente in the skillet with mushrooms. Toss to combine thoroughly – over medium heat. Stir the sauce constantly. Sprinkle with remaining Parmesan and garnish with parsley, if desired. Mix salt, pepper, paprika, oregano, cumin, and chili powder in a medium size bowl. Add shrimp to the bowl with spices and mix and toss to coat shrimp with spices. Heat 1 tablespoon of olive oil in a large frying pan on high heat. Add shrimp, coated with spices, and cook about 3 minutes on each side, until shrimp becomes red in color on each side. Remove pan from heat. Add cooked shrimp to fettuccine alfredo. Cauliflower Sauce Recipe is inspired by Pinch of Yum. This sounds yummy! However, as written, you have a pan for the cauliflower, a pan for the sauce, a blender/food processor, a pan for the mushrooms, a bowl and a pan for the shrimp, a pan for the pasta, a pan for the peas, plus other odds and end — measuring cups and spoons, cheese grater, serving dishes, etc. I would never do that to my daughter, who does the dishes. Having said that, one can certainly figure out how to do this with fewer pans and dishes. And I will. This Sauce Is Wonderful! I Tried It With The Recipe Given And My Entire Family Had No Idea It was Made With Cauliflower! Tonight Im Doing It With Chicken And Proscuitto Carbonara. I Am Confident It Will Turn Out Just As Amazing! Thanks For The Recipe. Please Ignore All The Caps My Phone Is Doing It Automatically And I Don’t Have The Patience To Ho Back And Correct Them All Lol.